SILVERSTONE…. WHAT HAPPENED TO THE HEATWAVE? 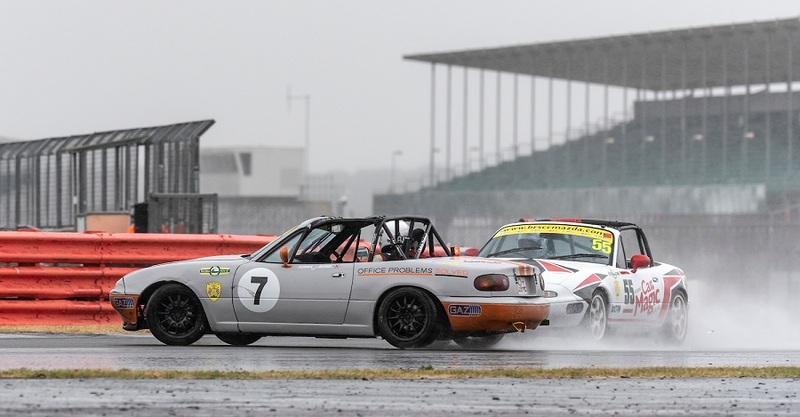 The BRSCC Mazda MX5 Championship Silverstone weekend started on the Friday with testing in bright sunshine and good dry conditions… perfect for getting used to a new circuit. And some good lap times were recorded in testing. However, this was all to change on race day! I qualified 15th of 30 in my qualifying group which put me on pole position (a new experience) in the first Group B race. I started with a dry setup on the car. Unfortunately, the heavens opened and this made the track very treacherous. I slipped down to 3rd, and then on the 4th lap, I made a mistake and missed my braking point. In the wet, this is bad… very bad. Knowing that I wasn’t going to stop and with two cars right in front, I decided to bail and went to the right so I wouldn’t hit the cars in front. This dropped me all the way down to 21st place! Nevertheless, throughout the race I clawed my way back, and finished 7th. I was frustrated but also pleased with how I has made progress up the field in the wet. For the second race, I started in 7th. This time, the car was setup for full wet, as the track was already soaked. In the early laps, I made up places into 5th place, with a couple cars spinning due to the conditions. I was then following Adrian Burge around who was defending well; my race seemed to hit a stalemate, with Hector Hurst (in another AB Motorsport car) behind me. More than a few laps passed with me following Adrian. However, coming into the braking zone for the first corner, I couldn’t brake hard enough with Adrian straight ahead of me. Unable to stop in the wet, I bumped Adrian into the corner. His car spun around and an immediate feeling of regret overcame me. I finished the race in 4th position. But in MX-5 Championship racing, it’s always sensible and good manners to say sorry. I left Parc Ferme and went straight to Adrian’s garage to apologise. He was understandably frustrated but also understood that anything can happen in torrential conditions. My finish put me onto the back of the grid for the A race. Again in torrential rain, I put my head before my heart and made sure I brought the car home in one piece. Car Magic will be pleased! Watch 20 minutes of rain-affected racing – my in car video below and on my Youtube channel. Previous Post: OULTON PARK… A SECOND PODIUM! Next Post: ANGLESEY…HERE COMES THE RAIN AGAIN!